Integration with the Chrome DevTools Timeline. When the User Timing function performance.measure() is called during a Timeline recording, DevTools automatically adds the measurement to the Timeline's results, as shown in the my custom measurement label in the screenshot below. In your report, Lighthouse lists every instance of console.time() that it finds under URLs. Replace each of these calls with performance.mark(). 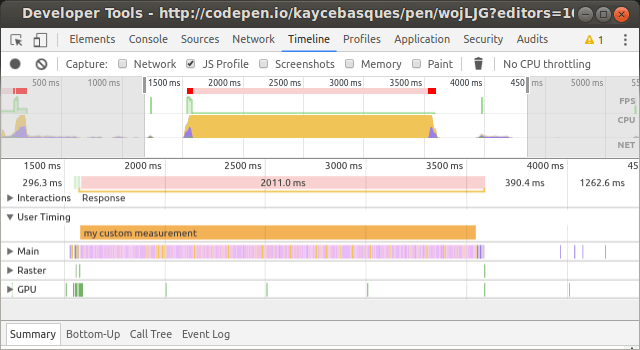 If you want to measure the time that has elapsed between two marks, use performance.measure(). See User Timing API: Understanding Your Web App to learn how to use the API. Lighthouse reports every instance of console.time() that it finds from scripts that are on the same host as the page. Scripts from other hosts are excluded, because Lighthouse assumes that you don't have control over these scripts. So, there may be other scripts using console.time() on your page, but these won't show up in your Lighthouse report.